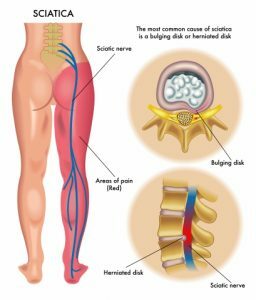 Chiropractic Adjustment Edmonton: Do You Have Sciatica? Pain anywhere in your body is extremely frustrating, even more so when you don’t know the cause of the pain. Neck pain, lower back pain, or leg pain can have various causes. If you are experiencing leg pain or lower back pain, or pain anywhere down to your toes, there could be an issue with your sciatic nerve. Divine Spine wants to help you understand what the symptoms of sciatic nerve pains are. Knowing the symptoms means you are able to seek treatment sooner and recover faster. Come see Divine Spine for sciatica treatments and adjustments. Feel Weak in the Knees? Typically, when dealing with sciatic problems, it is only felt in one knee and also throughout the entire leg. The sciatic nerve runs from the lower spine down to your toes and when it becomes pinched, it can create a tingling sensation, pain, or weakness. Most patients will seek treatment for the pain; however, the weakness is what is really concerning to doctors and practitioners. Could it be Piriformis Syndrome? If you are experiencing leg pain, but are not a runner, the cause could be because of a herniated disc. A syndrome called piriformis syndrome, which is uncommon, but affects athletes and has very similar symptoms to sciatic nerve pain. Symptoms of piriformis are also pain, tingling, or numbness located throughout the leg. However, piriformis is caused by the piriformis muscle pushing on the sciatic nerve. Sciatic nerve pain is difficult to pinpoint and therefore challenging for practitioners to diagnose. You may be experiencing pain that is not nerve related, but rather just tight muscles. When you are trying to determine where the pain is coming from, try putting pressure on the muscles located around your lower back. If there is a knot in the center that when it has pressure put on it, sends pain throughout the body, that muscle may not be getting the blood or nutrients it needs. A simple stretch can be the answer to whether you have sciatic nerve pain due to a slipped disc. Lay down with your legs stretched out and have someone raise the affected leg for you by 30 to 70 degrees. By stretching your leg, it is also stretching the sciatic nerve and will send pain signals through the leg, especially below the knee, if the sciatic nerve is pinched. When you are experiencing leg pain and want answers and relief, visit a practitioner at Divine Spine. We provide treatment for sciatic pain, neck pain, or lower back pain with computerized treatments. Get the best wellness care from the wellness center, Divine Spine.